Visit the ABA online store to purchase ABA publications, ABLS handbook, custom ABA ties and scarves, apparel, job postings for your burn center, email communication to ABA membership, and other services. Over 2,000 members have been responsible for progress in education, research, rehabilitation, care and prevention in the burn care field. 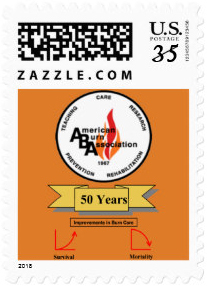 The custom ABA commercial U.S. postage stamp was developed in honor of the ABA and depicts the “Improvements in Burn Care,” illustrating Survival and Mortality graphs.